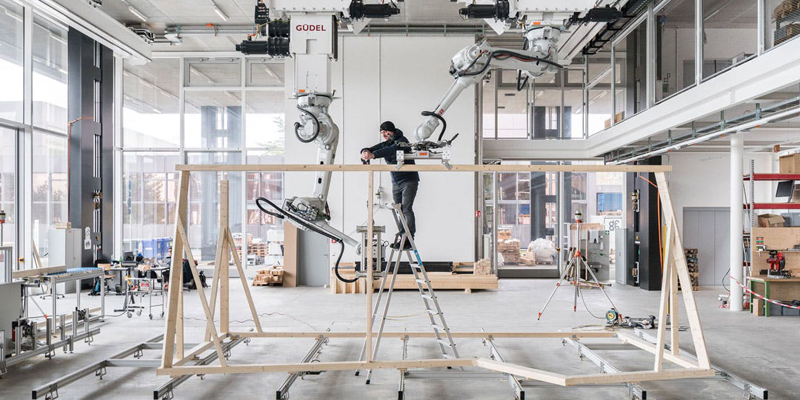 Spatial timber assemblies at the ETH Zurich Robotic Fabrication Laboratory. Photo: NCCR Digital Fabrication/Roman Keller. With support from the National Centre of Competence in Research, scientists at ETH Zurich have adopted an innovative technique for digital timber construction as part of a real-time project that allows efficient construction and assembly of geometrically complicated timber modules. The load-bearing timber modules prefabricated by robots will be assembled at the DFAB HOUSE construction site in Dubendorf, on the top two floors. The robot takes a timber beam and steers it to be sawn to the desired size. Following an automated tool change, another robot drills the needed holes for linking the beams. Finally, both the robots work in tandem to position the beams in the exact spatial arrangement depending on the computer layout. In order to avoid collisions while positioning the individual timber beams, the scientists have created an algorithm that continuously re-computes the path of motion of the robots based on the present state of construction. Then, workers manually bolt the beams together. Information from a computer-aided design model is used by the robots to cut and organize the timber beams. This technique was specifically devised during the project and employs a range of input parameters to develop a geometry that comprises a total of 487 timber beams. In contrast to conventional timber frame construction, spatial timber assemblies can do even without reinforcement plates since the needed load-bearing and rigidity are achieved from the geometric structure. Apart from saving material, this technique also opens the door for innovative, creative probabilities. View a video demonstration of the expanded range of possibilities for traditional timber frame construction thanks to the new robotic method.